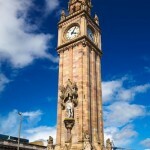 One of the most famous sights and landmarks of Belfast is Albert Memorial Clock. It is located and the Queen’s Square in the very center of Belfast, so easy to find. It was built in memory of Prince Albert and was built between 1865 and 1869. It is made of sandstone and the memorial clock is more than 34 metres high (or 113 feet). If you compare it with Big Ben in London (96 metres high) it doesn’t feel that big, but in the surrounding of Belfast this is still a wonderful attraction. Albert Memorial Clock was damaged by a bomb attack in 1992, but in the start of the 21st century a lot of money was used on repairing the damage, and the memorial clock is today as beautiful as ever before.